View our range of high quality, reliable, 100% Italian made medium line commercial cooking and catering equipment. With a range of solutions to suit different types of use in kitchens of every size from very small to medium-large, always in stock and ready to ship Australia wide. Two burner gas cook top. Four burner gas cook top. Six burner gas cook top. Eight burner gas cook top. Four burner gas cook top with gas oven underneath. Four burner gas cook top with electric oven underneath. Four burner gas cook top with electric oven underneath and electric ignition. Six burner gas cook top with gas oven and neutral cabinet underneath. Six burner gas cook top with large full length oven underneath. Eight burner gas cook top with two gas ovens underneath. Gas target top with gas oven underneath. Gas split module target top with two open burners and gas oven underneath. Four burner electric cook top. Six burner electric cook top with electric oven and neutral cabinet underneath. Two burner induction cook top. Four burner induction cook top. Smooth mild steel gas griddle. 2/3 smooth 1/3 ribbed mild steel gas griddle. 2/3 smooth 1/3 ribbed chromed gas griddle. Smooth mild steel electric griddle. 2/3 smooth 1/3 ribbed mild steel electric griddle. 2/3 smooth 1/3 ribbed chromed electric griddle. Smooth chromed gas griddle with gas oven underneath. Smooth chromed gas griddle with electric oven underneath. 26L capacity gas pasta cooker. 2 x 26L capacity gas pasta cooker. 26L capacity electric pasta cooker. 2 x 26L capacity electric pasta cooker. 17L capacity gas deep fryer. 2 x 10L capacity gas deep fryer. 2 x 17L capacity gas deep fryer. 17L capacity electric deep fryer. 2 x 10L capacity electric deep fryer. 2 x 17L capacity electric deep fryer. Large floor model gas stock pot burner. 60L capacity gas bratt pan. 60L capacity electric bratt pan. 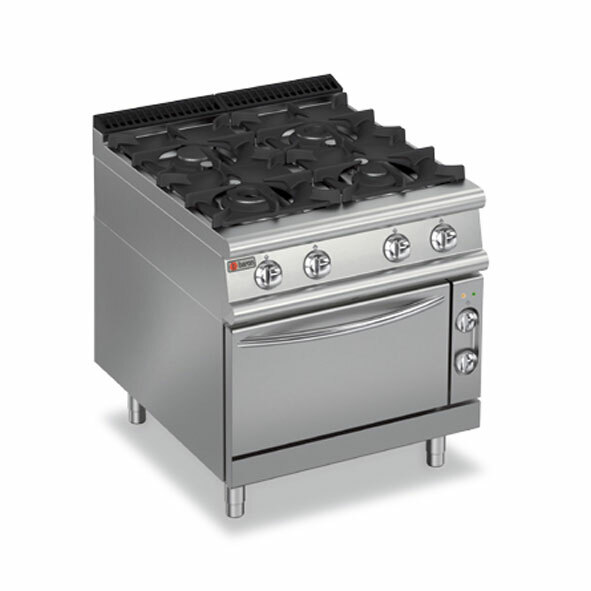 Static gas oven suitable for mounting cook top appliances. Static electric oven suitable for mounting cook top appliances. Two door electric refrigerated base. Four drawer electric refrigerated base. Three door electric refrigerated base. Six drawer electric refrigerated base. Neutral bench top 200mm wide. Neutral bench top 400mm wide. Neutral bench top 600mm wide. Neutral bench top 800mm wide. Neutral bench top with drawer 400mm wide. Neutral bench top with drawer 600mm wide. Neutral bench top with drawer 800mm wide. At just 700 mm deep, this range of equipment can be manufactured according to your exact requirements, without making any sacrifices and without any limits in terms of its composition. Equipment designed and built to guarantee total safety as well as perfect hygiene with the utmost in energy efficiency. The wide choice of models (versions on an open base unit or over an oven or counter-top) allows the ideal solution to be found whatever the need or type of environment.